Other branches of law have inevitably become bound up with energy law, making it difficult for the legal practitioner to gain a clear appreciation of the entire field, especially in a transnational context. This subset of the International Encyclopaedia of Laws covers national and international energy law. Each national monograph contains a general introduction, a description of the country's energy legislation, an overview of the basic principles of energy law, the historical background, the role of governmental institutions, and the sources of energy law in that country's legal system. Each country's regulatory framework concerning electricity, gas, petrol and coal is fully set forth, with emphasis on the aspects of production, exploitation, transport, distribution, and consumption. Each monograph also deals with the interactions of energy law with environmental law, tax law and competition law. In addition, Energy Law includes international monographs covering international legislation and treaties and the energy law of the European Union. Front Matter: International Advisory Board. Encyclopaedias and Editors. Introducing the International Encyclopaedia of Laws. Curriculum vitae of the General Editor. General Section: List of Contributors. 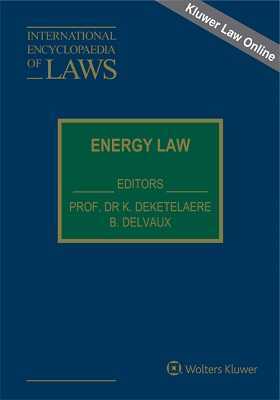 Introducing the International Encyclopaedia of Energy Law . Curriculum vitae of the Editor.